Timothy Orpen is delighted to join conductor Robin Browning and the de Havilland Philharmonic to perform Weber’s much-loved Second Clarinet Concerto in their Celebration of Spring Concert this Sunday. The ‘Radio 3 in Concert’ broadcast of the complete concert, in which Timothy Orpen performed the Finzi Clarinet Concert with the Royal Northern Sinfonia, is available here. It will be available until the end of March. You can also hear their rather fabulous encore! Timothy Orpen, Principal Clarinet of the Orchestra of the Royal Opera House, Covent Garden and a founder member and Principal Clarinet of Aurora Orchestra, spent three years as Principal Clarinet of the Royal Northern Sinfonia prior to joining the ROH. He is delighted to return to the Sage to perform Finzi’s Clarinet Concerto with the RNS. The concert will be broadcast live by BBC Radio 3. We are delighted to announce that Timothy Orpen has been appointed Principal Clarinet in the Orchestra of the Royal Opera House and will take up the position in October. Timothy Orpen is joined centre stage by fellow Royal Northern Sinfonia principals Stephen Reay bassoon and Peter Francomb horn in a programme which showcases the orchestra’s home grown talent. For his “Up Close” recital on 10th February, Royal Northern Sinfonia clarinettist Timothy Orpen has picked a selection of chamber music featuring the clarinet, including works by Finzi, Widmann, Brahms, Giampieri and Mozart’s playful Kegelstatt Trio (apparently written whilst also playing a game of skittles). In this week’s episode of Artsnight on BBC 2, the acclaimed artist Edmund de Waal looks at the theme of memory and art. Nicholas Collon and Timothy Orpen contribute to the discussion, representing Aurora Orchestra who gave a highly acclaimed, memorised performance of Beethoven’s ‘Pastoral’ Symphony at this year’s proms. Following on from the hugely successful concert at King’s Place in London with the Academy of St. Martin-in-the-Fields Chamber Ensemble, which was broadcast live on BBC Radio 3, Timothy Orpen is delighted to have joined the Ensemble on their tour of the USA and Canada. Food poisoning gets in the way of Weber, and reducing musicians to tears – all in a day’s work for Timothy Orpen, clarinettist in the Aurora Orchestra. If you weren’t at the Royal Albert Hall to witness Aurora orchestra’s Prom last Sunday, you can watch in on BBC 4 this evening at 7pm. We urge you to do so, or to watch it via the BBC iPlayer over the next 30 days. Timothy looks forward to his BBC Proms Chamber Music Concert at Cadogan Hall this lunchtime as part of the Royal Northern Sinfonia Winds with Christian Blackshaw. Timothy looks forward to being involved in the inaugural ‘Wilde Weekend’, the world’s first annual multi-arts festival celebrating the life and work of Irish writer, Oscar Wilde. Timothy Orpen shares his thoughts about this concerto, which he will be performing with the Royal Northern Sinfonia. Timothy is performing some particularly interesting repertoire over the next few months, including Steve Reich’s New York Counterpoint, a mesmeric work for live and multi-track recorded clarinet. A few days before his performance of the Copland Clarinet Concerto with the Royal Northern Sinfonia at Middlesborough Town Hall, Timothy Orpen will be giving this master class for young emerging clarinettists in the area. Timothy will be performing this beautiful concerto in three concerts with the Royal Northern Sinfonia. The world premiere of Aaron Holloway-Nahum’s clarinet quintet “Arrangements of Five” – commissioned by Timothy Orpen with funds from the RVW Trust and Britten Pears Foundation – will be given by Timothy Orpen and the Gildas Quartet on 14th October. Ian Venables’s Canzonetta for Clarinet and String Quartet, commissioned jointly by Bromsgrove Concerts and Droitwich Concert Club, will be given its world premiere performance tomorrow evening by Timothy Orpen and the Cavaleri Quartet. Timothy Orpen’s recent performance of the Mozart Clarinet Concerto with the Bournemouth Symphony Orchestra will be broadcast this evening, 27th December, as part of Classic FM’s Full Works concert at 8pm. Timothy Orpen gives three performances of the Mozart Clarinet Concerto with the Bournemouth Symphony Orchestra this Autumn. We are delighted to announce that Timothy Orpen has been appointed as the Royal Northern Sinfonia’s Principal Clarinet. The coming year will see the creation of new clarinet quintets from two of the most exciting young composers in the UK. With support from the Britten Pears Foundation and the RVW Trust, composers Luke Styles and Aaron Holloway-Nahum will write works for clarinet and string quartet. Australian born composer Luke Styles is the Young Composer in Residence at Glyndebourne and Aaron Holloway-Nahum’s most recent accolades include working with the BBC Symphony Orchestra, having been selected for the Sound and Music Embedded scheme. These new compositions expand the repertoire for clarinet and string quartet and will work particularly well when programmed alongside established clarinet quintets. They will also appeal to a wide range of players and audiences. In addition, Timothy Orpen will premiere Ian Venables’ Canzonetta for Clarinet and String Quartet, alongside the Quintets by Mozart and Brahms, with the Cavaleri Quartet in 2014. 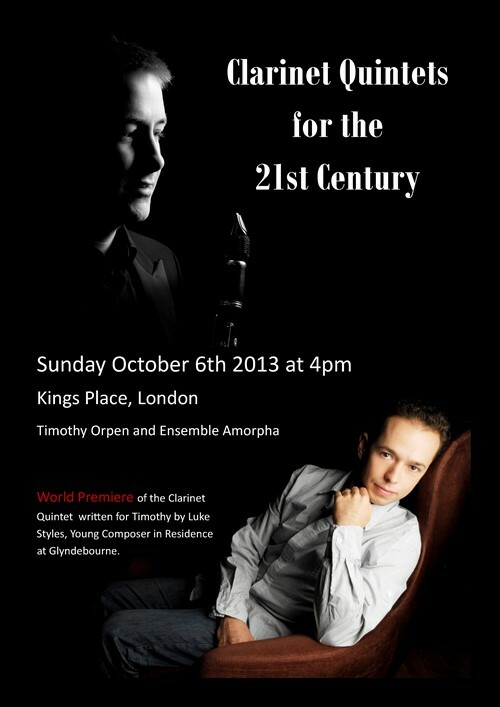 The premiere of Styles’ Quintet will take place in a concert entitled Swiss Connections on October 6th 2013 at 4pm in Kings Place, London, with clarinettist Timothy Orpen and Ensemble Amorpha. The Quintet will feature a movement for solo clarinet which can also be performed separately, enhancing the performance opportunities for this new work. Timothy is currently in China where he (with fellow principal members of Aurora) performs Messiaen Quartet for the End of Time, Berg Four Pieces for Clarinet and Piano, Op. 5 and Schoenberg (arr. Webern) Chamber Symphony No. 1 in E major, Op. 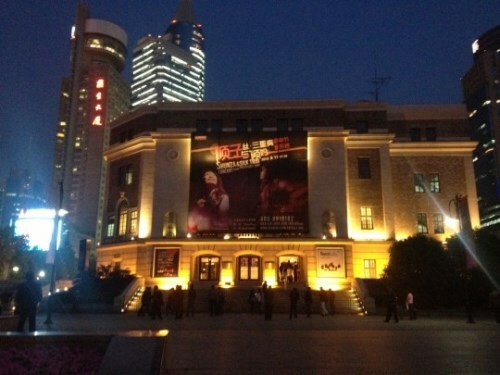 9 at Shanghai Concert hall. Timothy is delighted to have been able to invite Luke Styles (Glyndebourne Young Composer in Residence) to write a new work for clarinet and string quartet. Timothy is very grateful to the RVW Trust and the Britten-Pears Foundation for funding this commission. More news will follow in due course, particularly of the premiere performance. News of an additional new work which will also be written for Timothy during 2013 will follow shortly! 18th November 2012 – 7:00 pm – Aurora Orchestra – LSO St Luke’s, 161 Old St London.Klez-Mahler – as part of the New Moves series featuring Mahler (arr. Farrington) Symphony No. 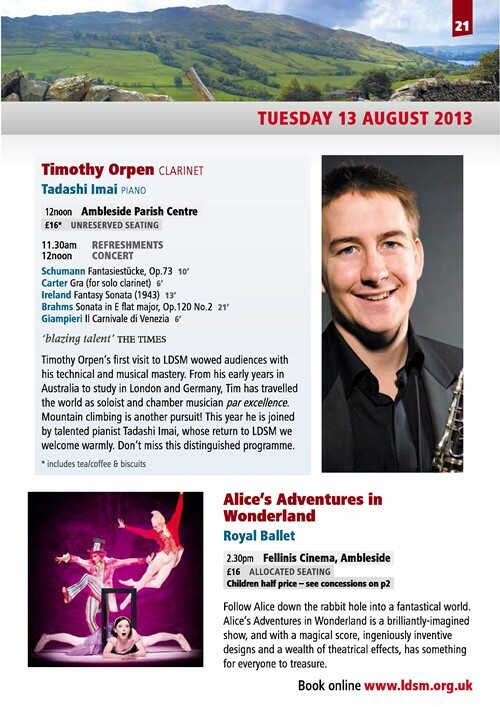 1 and klezmer – hear Timothy Orpen in action! If you have not yet seen the broadcast of this fantastic concert, and were not there yourself, DO try to see it when it is broadcast again this Friday on BBC1 at 4pm! Timothy Orpen will be performing in two concerts at this year’s Lake District Summer Music Festival..
On the 2nd August he is joined by Yuko Inoue (viola) and Simon Lepper (piano) to play works by Debussy, Mozart (Kegelstatt Trio), Widmann, Clarke (Prelude, Allegro, and Pastorale) and Weber. The next day he collaborates with the Chilingirian Quartet, whose programme includes the Mozart Clarinet Quintet. Timothy Orpen and Simon Lepper will be interviewed by Sean Rafferty ahead of their recital at St. George’s, Bristol the next day. The programme will include live performances of Mozart, Bärmann and Milhaud. If you miss the live broadcast (which starts shortly after 6pm) the programme will be available for a further seven days via the BBC Radio 3 website. An excerpt of the Mozart Clarinet Quintet, performed live on Radio 3’s ‘In Tune’ programme by Timothy Orpen and the Australian String Quartet, can be heard here. For the third year in succession, the Aurora Orchestra (of which Timothy Orpen is a founder member) performs winning compositions selected from hundreds of entries to the BBC Proms ‘Inspire’ Young Composers Competition. Presented by Sara Mohr-Pietsch, excerpts from the concert will be broadcast on Radio 3 following Prom 27 on Friday 6 August, and will include some performances by Timothy as part of a small chamber ensemble.